We’d love your help. Let us know what’s wrong with this preview of Cyrion by Tanith Lee. He came to the Honey Garden looking for Cyrion. He was a man in grave danger, convinced only one man alive could help him. A man he had heard about in song and story. A man practically everyone knew something about. A man he had never met. Some said he was the stolen son of a western king, raised by nomads in the desert. A freelance swordsman, a sorcerer, a master of He came to the Honey Garden looking for Cyrion. He was a man in grave danger, convinced only one man alive could help him. A man he had heard about in song and story. A man practically everyone knew something about. A man he had never met. Some said he was the stolen son of a western king, raised by nomads in the desert. A freelance swordsman, a sorcerer, a master of disguise, some said he attracted bizarre, uncanny events as some persons attract misfortune. He with hair like the sky of earnest sunrise, his fair complexion, his whiplash reactions and quicksilver elegance was like a being from another world. A legend. A myth. And was he for hire? To ask other readers questions about Cyrion, please sign up. a number of stories and one novella starring Cyrion the smug, angel-faced do-gooder, master swordsman and master of disguise, righter of wrongs, deliverer of women and children and chubby noblemen (as long as they have their hearts in the right place), deliverer of ironic bon mots at the expense of the nitwits who have the nerve to converse with him in a tavern about their various nitwit plots. this was a favorite of mine when very much younger. I read the stories again and again. the novella, n a number of stories and one novella starring Cyrion the smug, angel-faced do-gooder, master swordsman and master of disguise, righter of wrongs, deliverer of women and children and chubby noblemen (as long as they have their hearts in the right place), deliverer of ironic bon mots at the expense of the nitwits who have the nerve to converse with him in a tavern about their various nitwit plots. this was a favorite of mine when very much younger. I read the stories again and again. the novella, not so much. despite her reputation as a goth vampire spinning cold-blooded yarns full of nightmares and disturbing sexuality, Tanith Lee had a wide range of subjects and a surprisingly elastic style. this book finds her showing off her skills in a lighter register, much in the vein of Jack Vance's The Dying Earth series and her own splendid novel Kill the Dead. the gorgeous, at times even overripe prose is still present, but the tone is cheerful and the dialogue is often sparkling. the book is witty as Cyrion is witty. 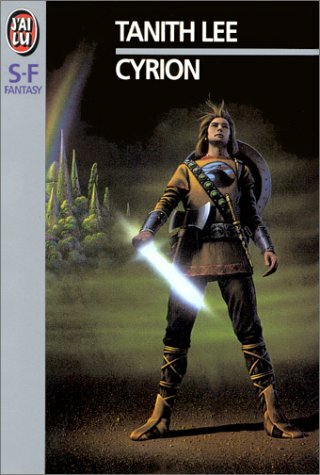 besides being high fantasy, it is also a series of absorbing mysteries with a specific formula: (1) Cyrion is approached to do a job or right a wrong; (2) Cyrion investigates, smugly; (3) Cyrion rights the wrong and the reader learns that not everything is as they appear and the answer to a puzzling mystery is delivered, smugly of course, but sometimes with a tinge of melancholy at the inevitable cupidity and stupidity of human beans. the puzzles displayed are most often ingenious ones. the novella suffers a bit, if only because the preceding stories so fully prepare the reader to realize that all may not be what they appear: certain villains may not be villainous; heroic types may be fools or worse; the downtrodden may not be so diminished after all. very little surprised me here, but the wonderful writing still made "Cyrion in Stone" a treat. The framing device is genius. Roilant, a slobbish young noble in unspecified danger, attempts to hire the renowned Cyrion--warrior, rogue, troubleshooter, possibly wizard--who, Roilant is convinced, is the only person able to resolve the situation. Instead, in some middling-grade alehouse, he only finds rumors and "you just missed him" comments, with each person contributing a tall-tale story of the prowess of this Cyrion. To Roilant's ever-growing frustration, of course. And, truthfully, if the The framing device is genius. Roilant, a slobbish young noble in unspecified danger, attempts to hire the renowned Cyrion--warrior, rogue, troubleshooter, possibly wizard--who, Roilant is convinced, is the only person able to resolve the situation. Instead, in some middling-grade alehouse, he only finds rumors and "you just missed him" comments, with each person contributing a tall-tale story of the prowess of this Cyrion. To Roilant's ever-growing frustration, of course. And, truthfully, if the entire volume had been that, I would have been happy. The stories are presented within the frame: possibly truth, possibly fabricated, possibly embellished beyond recognition. If there is a weakness to the bunch, it is that Cyrion is presented as inhumanly capable and perceptive. As with the Sherlock Holmes collection, the reader eventually succumbs to the pattern and always knows that Cyrion is at least one step ahead of the game, is in control of the situation, and probably figured it all out from the very start. But each story is so charming and delightfully written--think Jack Vance with his vocabulary and ornate language under control--that I gave the repetition of style a pass and loved each one. The framing device, poor Roilant and his unstated problem, could resolve itself or not. But then Cyrion appears on the scene, and the framing device becomes the story, a novella of nearly half the book. The longer form wears out its welcome a bit, as each twist and turn becomes more fractal: the family in question is preposterously dysfunctional, and layers of scheming interact with one another. The question is not who is guilty, it is who, if any, are innocent. I suspect my love of this book has more to do with the early age at which I imprinted on it, rather than actual quality, but I dearly love it. The book is arranged around a framing device - a young nobleman needs to hire a mercenary (not just any mercenary, but the best: Cyrion) and spends a day paying the denizens of an inn for information about the elusive swordsman. Each chapter is a story, exaggerated, dramatic, perhaps a bit excessive in its descriptions of Cyrion's beauty and skills, but c I suspect my love of this book has more to do with the early age at which I imprinted on it, rather than actual quality, but I dearly love it. The book is arranged around a framing device - a young nobleman needs to hire a mercenary (not just any mercenary, but the best: Cyrion) and spends a day paying the denizens of an inn for information about the elusive swordsman. Each chapter is a story, exaggerated, dramatic, perhaps a bit excessive in its descriptions of Cyrion's beauty and skills, but compelling nonetheless. At last the nobleman, Roilant, finds his mercenary, and the last third of the book is the novella of the job Roilant needs done. The tone is different for the last piece, more realistic and gritty, though still gorgeous. It is a truism that villains steal the stage. Milton wrote Paradise Lost to justify God to Man; and Satan swipes every line of the epic. Bad guys gets to camp it up or play it cool, as they wish. They tap into the happy-power of the Id, while the hero struggles to decide why he wants to save the world if it costs him his girl, his rent and his life. Fantasy readers weary of this disproportion often ask for a hero who isn't a stalwart bore or an emotional kitchen-drawer of repression. Ms. Lee give It is a truism that villains steal the stage. Milton wrote Paradise Lost to justify God to Man; and Satan swipes every line of the epic. Bad guys gets to camp it up or play it cool, as they wish. They tap into the happy-power of the Id, while the hero struggles to decide why he wants to save the world if it costs him his girl, his rent and his life. Ms. Lee gives us one. Cyrion is flat-out the coolest hero to flash a clean grin in a dirty tavern since Zorro. True, Captain Carrot has a nice smile and clean soul; but he's weird. We know Carrot is good, but no one knows what the hell he is thinking. Tarzan? cool, but belongs in rural setting. Fahfryd? admirable rogue; but wrong alignment. Aragorn? Too burdened. Cyrion doesn't do burdened. The stories are thrown together mysteries; the joy of these interconnected tales are Lee's narration of a person who is so sly and yet so charitable; so winning and yet so approachable. I don't think many writers would dare create a Cyrion; it would be like coloring outside the lines of the sacred picture of a hero: broken-hearted, life-burdened, angst-driven and dull. This is a collection of stories revolving around the titular character, who, on his travels, encounters various people and situations where he needs his wits to get him through. The stories are more like mysteries in the vein of Sherlock Holmes or Edgar Allen Poe's Dupin tales, but taking place in a fantasy setting. A pretty good read with some clever moments. This is so totally Lymond Chronicles AU fanfic. I would probably like it better if I didn't hate Lymond. Cyrion. Whoever. 3.5 stars. This collection consists of 8 short stories and a novella. I found the novella somewhat contrived. This is a collection of stories featuring the freelance swordsman and sorcerer Cyrion. Reviewer James Nicholl describes Cyrion as a mix of Sherlock Holmes and Batman with a touch of Zorro, which is a description I don't think I can better. Lee's a great writer, I've no doubt, and good enough prose can usually win me over. Yet, somehow, she manages to muddy and confuse what's otherwise an wonderful premise. Half the novel's an S&S Rashomon – tavern patrons swapping stories about the titular hero Cyrion – and, though the stories themselves are a little overwrought, it seems a perfect opportunity to, when Cyrion arrives halfway through the volume, to shatter all those expectations that've painstakingly be set up for him. Instead, Lee's a great writer, I've no doubt, and good enough prose can usually win me over. Yet, somehow, she manages to muddy and confuse what's otherwise an wonderful premise. Half the novel's an S&S Rashomon – tavern patrons swapping stories about the titular hero Cyrion – and, though the stories themselves are a little overwrought, it seems a perfect opportunity to, when Cyrion arrives halfway through the volume, to shatter all those expectations that've painstakingly be set up for him. "Sword and sorcery" classica, molto classica. Il romanzo è diviso in due parti: nella prima la struttura è simile al Decameron, con una cornice comune in cui vengono incastonate storie aventi come protagonista il barbaro Cyrion. La seconda metà del libro è costituita da un'unica, lunga avventura dello stesso Cyrion. Il protagonista è una versione dall'intelletto acuto di Conan, e le storie spaziano dallo scontro con il classico stregone cattivo al giallo, passando per il sopranna Una bella sorpresa. Il protagonista è una versione dall'intelletto acuto di Conan, e le storie spaziano dallo scontro con il classico stregone cattivo al giallo, passando per il soprannaturale, senza mai perdere il piglio avventuroso tipico di questo genere di narrativa. Cyclic episodic stories in an interwoven narrative. As seems on par with my recent reactions to Lee's work, I enjoyed the short stories that made up the first half of this work far more than I did the novella of the second half. The short stories were wonderful: very creative, clever little puzzles. The novella? Lee wrote herself in to a world of red herrings and Russian-doll reveals, the constant exchange of which I quickly found tedious. This is worth reading if you find it on hand, but I would Cyclic episodic stories in an interwoven narrative. As seems on par with my recent reactions to Lee's work, I enjoyed the short stories that made up the first half of this work far more than I did the novella of the second half. The short stories were wonderful: very creative, clever little puzzles. The novella? Lee wrote herself in to a world of red herrings and Russian-doll reveals, the constant exchange of which I quickly found tedious. I read this book back in the early 80s and loved it. I still love it. Just an unusual fantasy, written in an unusual style that attempts to portray a medieval middle eastern flair. This is a series of short stories describing the adventures of a swordsman, who is more an adventurer than a sell sword. He deals with sorcery with both wit and humor. The stories are told to a young man who is seeking this swordsman for help. Finally finished! Intricate, wordy prose and fun pulp short stories hampered by a bizarre structure and a top-heavy novella at the end. Wish it had focused more on Cyrion himself and less on dumb Roilant's romantic troubles. Fun collection of long short stories of Cyrion's mysteries. Good storytelling, enjoyable puzzles. The cover art is grotesque. Apart from that, this book is stunning, lush, perfect, sensual, and ultimately sad. It's a perfect book. Tanith Lee was a British writer of science fiction, horror, and fantasy. She was the author of 77 novels, 14 collections, and almost 300 short stories. She also wrote four radio plays broadcast by the BBC and two scripts for the UK, science fiction, cult television series "Blake's 7." Before becoming a full time writer, Lee worked as a file clerk, an assistant librarian, a shop assistant, and a wai Tanith Lee was a British writer of science fiction, horror, and fantasy. She was the author of 77 novels, 14 collections, and almost 300 short stories. She also wrote four radio plays broadcast by the BBC and two scripts for the UK, science fiction, cult television series "Blake's 7." Before becoming a full time writer, Lee worked as a file clerk, an assistant librarian, a shop assistant, and a waitress. Her first short story, "Eustace," was published in 1968, and her first novel (for children) The Dragon Hoard was published in 1971. Her career took off in 1975 with the acceptance by Daw Books USA of her adult fantasy epic The Birthgrave for publication as a mass-market paperback, and Lee has since maintained a prolific output in popular genre writing. Lee twice won the World Fantasy Award: once in 1983 for best short fiction for “The Gorgon” and again in 1984 for best short fiction for “Elle Est Trois (La Mort).” She has been a Guest of Honour at numerous science fiction and fantasy conventions including the Boskone XVIII in Boston, USA in 1981, the 1984 World Fantasy Convention in Ottawa, Canada, and Orbital 2008 the British National Science Fiction convention (Eastercon) held in London, England in March 2008. In 2009 she was awarded the prestigious title of Grand Master of Horror. Lee was the daughter of two ballroom dancers, Bernard and Hylda Lee. Despite a persistent rumour, she was not the daughter of the actor Bernard Lee who played "M" in the James Bond series of films of the 1960s.